BestNursingDegree.com interviews nurse anesthetist, Debbie Malina, CRNA, MBA, DNSc. Debbie has worked in a variety of practice settings as well as in clinical instruction. She is currently serving as President-elect of the American Association of Nurse Anesthetists. Below, Debbie explains what it’s like to work as a CRNA. Q: How did you get started in nursing? I started out working in a nursing home as a nurse’s aide in high school, and that’s how I got interested in nursing. At the very beginning of my career, I first practiced as a Licensed Practical Nurse (LPN). [From there I went] to being an associate’s degree RN with a two-year nursing degree. I got my bachelor’s degree in nursing, and then got a Master of Science degree in anesthesiology. From there I got a Doctorate in Nursing Science (my degree is: M.S. in Anesthesiology). I have been working as a clinical nurse anesthetist the majority of my career: for the past seven years as an independent contractor in an around the Memphis, Tennessee area. I contract my anesthesia services to a variety of entities: anesthesia groups, individual hospitals, and office-based practices. Now, I’m actually the president-elect of the American Association of Nurse Anesthetists, and that takes up a good bit of time. I’m going back into academia a little more full-time to teach, and I will still be working clinically, [in addition to] my duties with the AANA. Q: What’s an average day like for a CRNA? The majority of nurse anesthetists work in the clinical setting – they work in the operating room and provide anesthesia services. I interview patients individually before I provide their anesthetic. I plan the anesthetic technique: whether the patient will go to sleep and have a general anesthetic for his or her surgery or some kind of regional [anesthetic] or pain block. Again, it depends on the patient, the surgeon, and the type of surgery. After I talk to the patients and do a pre-op anesthesia assessment, I generally start getting them prepared for surgery by giving them a little anti-anxiety medicine to help them to start to relax. It’s critical to build up a relationship with your patient. When you care for patients under anesthesia, you are taking care of them when they are at their most vulnerable. It’s a huge responsibility, so it’s critical that they are comfortable with the person who is providing their anesthetic. I stay with [patients] the entire time that they’re in the operating room until I deliver them to the recovery room nurse. If the patients are in-patients, and they stay overnight, I try to go see them the next day to see how they’re doing, how they felt about their anesthetic, and to check if they have any concerns. If it is an out-patient who is going home that day, I try to get to the ambulatory surgery area before the patient goes home. Unfortunately, it’s not always possible to make these visits because of caseload, but I try. Q: How many patients does a CRNA take care of on a typical day? It really depends on what kind of procedures you’re doing. For example, if you’re doing anesthesia for cataract surgery you may care for 20, 30 or 35 patients in a day because surgeons can perform a cataract surgery in about six minutes. On a day when you’re doing major surgeries – back surgeries, neurosurgeries – you may only do one or two cases. It really varies depending on the type of procedure. The preparation for today’s nurse anesthetists is extremely rigorous. For starters, you are required to have a Bachelor of Science degree in nursing or other appropriate baccalaureate degree. For example, someone may have an associate degree in nursing, and a bachelor’s degree in pharmacology or biology. You then must have a current license as a registered nurse and obtain at least one year of experience working as a registered nurse in an acute care setting. What that generally translates into is ICU experience. For example, a nurse anesthesia program would not consider five years of med-surg experience appropriate experience; an applicant would be required to have recent critical care experience. To gain admittance to a nurse anesthesia educational program, there is a lengthy and involved application process as well as an interview. Nurse anesthesia programs vary in length – anywhere from 24 to 36 months – resulting in a master’s degree. Upon graduation, in order to practice, the nurse anesthetist must pass a national certification examination. To continue practicing, CRNAs must obtain a minimum of 40 continuing education credits every two years. In the near future, new nurse anesthetists will be required to earn a practice doctorate. Q: It sounds like it is a challenging program to get into? It is. And I would recommend that if someone is interested in a nurse anesthesia career, he or she should shadow a nurse anesthetist. For one whole semester in my undergrad program, I followed one of the nurse anesthetists around on the days that she was at work. By the time I applied to nursing anesthesia school, I was pretty sure that it was what I wanted to do. You have to be someone who is willing to accept the challenge, someone who can stay sharp during periods of monotony and respond swiftly, calmly, and expertly during emergency situations. You have to have excellent critical thinking skills and not second-guess yourself. When a patient needs your help, you need to be able to spring into action. You have to be able to stand up to some of the other strong personalities who are in the operating room and the surgical environment. [You must be able to] work with a group of physicians, anesthesia techs, and other nurses. [You need to be] someone who has real empathy in caring for patients because, as I explained earlier, you will be taking away their ability to care for themselves. You will be the one who is there not only to care for the patient, but to advocate for him or her. Q: What’s the difference between a CRNA and an anesthesiologist? The single biggest difference between a CRNA and a physician anesthesiologist is that the CRNA has a nursing background, and the anesthesiologist has a medical background. However, what people are usually more interested in knowing is, “What are the similarities between CRNAs and anesthesiologists?” There are many, many similarities. The books used by physician residents and nurse anesthesia students are the same. At some universities, anesthesia residents and nurse anesthetists take classes together. The types of cases they work with and the methods of anesthesia they are trained to perform are the same. (NOTE: they are NOT trained in the same rooms together). The standards of care for providing anesthesia are the same for both physicians and CRNAs. But when a physician practices anesthesia it is the practice of medicine. When a nurse anesthetist practices anesthesia, it is the practice of nursing, and nurses have been providing anesthesia for over 150 years. Initially – this is kind of interesting – when surgeons were first starting to do surgery, they could not find anyone that was interested in providing anesthesia. Most of the time they would recruit residents and make them do the anesthesia. Well, that wasn’t really what the residents wanted to do. They wanted to learn how to do surgery, and it was nurse anesthetists that stepped up to the plate and made it their specialty. It was actually the first advanced practice nursing specialty in history. Q: What kinds of changes have there been in nurse anesthesia in the last few years? CRNAs are still the primary providers of anesthesia in rural America. In some states, like in Tennessee, we provide virtually 100 percent of the anesthesia. Most recently, the Institute of Medicine said [advanced practice nurses] should be full partners with physicians and other health care professionals in the United States, not necessarily working under them or for them. We really need to step up to the plate and be able to work to our fullest potential. Further in 2010, two new studies confirmed beyond a shadow of a doubt the remarkable safety and cost effectiveness of nurse anesthesia care. In 2009, California became the 15th state to opt-out of the Medicare physician supervision requirement for nurse anesthetists, and in 2010, Colorado followed suit and became the 16th state. 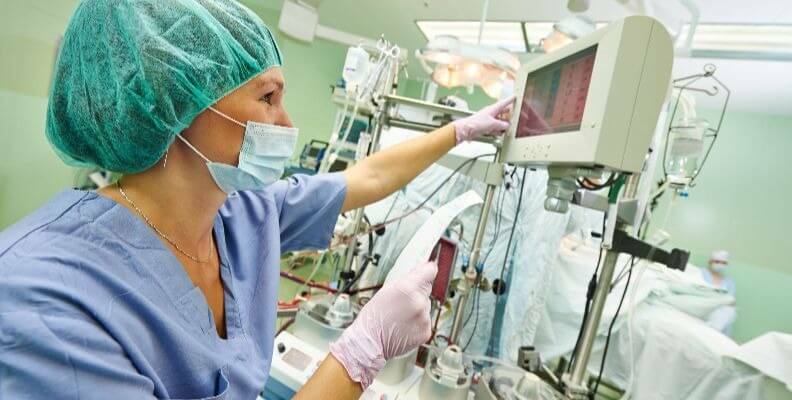 Nurse anesthetists have been the main providers of anesthesia care to U.S. Military personnel since World War I, and right now, in Afghanistan and Iraq, nurse anesthetists are the primary people who are there in the operating theatre providing anesthesia. Also, we were the first nursing specialty to get reimbursement from Medicare. We can bill Medicare directly. Q: What do you see for the future of nurse anesthesia? The future is bright for nurse anesthesia in the United States. There are more than 42,000 CRNAs and student nurse anesthetists who are members of the AANA, and that’s about 92 to 93 percent of all practicing nurse anesthetists. There are probably about 45 thousand nurse anesthetists practicing in the country right now. Without a doubt there will be a greater need for anesthesia professionals such as CRNAs as millions of previously uninsured Americans enter the health care system thanks to health reform, and as the economy starts to turn around and people who have been putting off elective surgeries become financially capable of having these procedures done. Q: What exactly is the schedule like for a CRNA? It really depends on your practice setting. CRNAs who work in trauma centers and obstetrical units in general work 24-hour shifts. They go in at 7 a.m., and they’re there until 7 a.m. the next morning. They do get downtime there to rest, and generally work two-24 hour shifts per week. But, there are CRNAs there to provide service 24/7/365. In some settings, people work eight-hour shifts, Monday through Friday. In other settings, people work 10-hour shifts or 12-hour shifts. Q: Any other recommendations for aspiring CRNAs? If you are accepted into a nurse anesthesia program, it is full-time. You cannot work, so you are dedicated for that 24 to 36 months to going to school to become a nurse anesthetist. The curriculum is rigorous. You do classroom as well as OR time – you don’t stop. As a student you don’t necessarily get out at 3 p.m. every day. You don’t necessarily just put in 40 hours. The time commitment is significant. Be prepared for that, and be prepared to not have an income. Even though loans are available, those student loans in general will not cover all of your living expenses. I think people have to be aware of that and have to be prepared for that – whether you’re living off savings, getting loans from other avenues, or having a spouse supporting you.